This 10 Inch Nickel Pumpkin may look frosty, but it's just the shiny metallic nickel finish. It will make a lovely addition to any Halloween decor scheme. Did you ever notice that pumpkin is just one letter away from being a "pump-KING?" Coincidence? We think not! Since this little squash is the number one decoration for Halloween and makes a delicious pie, we kind of think it was planned that way. They probably just left out the "G" so the good old Mr. Pumpkin could still feel modest. Whatever the case is, you'll have no problem decorating your place for a party when you have this squash around. Are you pumped for pumpkin season? Adorn your cozy cottage with a unique type of pumpkin. This 11" Round Mercury Pumpkin looks great on a dining room table. Collect all the different sizes of Mercury Pumpkins. Why be ordinary? Everyone has orange pumpkins. Give your decor a pumpkin of a different color with this 11" Tall Purple Glitter Pumpkin! Use it as a sparkling table centerpiece, or as part of an arrangement. Dare to be different! Give your seasonal decor a spooky yet elegant touch with this white resin pumpkin with spider web lace. It's a unique take on the traditional pumpkin decoration that will give your centerpiece or front step a little extra 'wow' factor. Having to go and pick up pumpkins every October is a serious bore. It'd be so much easier if you just had a fake pumpkin ready to go! This realistic pumpkin is perfect for reusing year after year for your seasonal decor! These 12 Piece Small Black Glitter Pumpkins can serve as place markers on a dining table. Or as party favors. Or as part of a centerpiece arrangement. Or anywhere else you want a bit of spooky glitter! Whether you use these 12 Piece Small Purple Glitter Pumpkins as party favors, placecard anchors, or decorative elements in a centerpiece arrangement, they're an easy way to add Halloween's hottest color to your decor. Purple is the new orange! This 12" Black Wire Glitter Pumpkin looks as if it's made of grapevines, and sprinkled with just enough glitter to give an occasional gleam in low light. If you're trying for a down-to-earth look in your seasonal decor, this will help you achieve it! Purple isn't a traditional Halloween decorating color, but it's gaining ground. It won't be long before it's just as common as orange. So get ahead of the trend by adding this 13 Inch Purple Glittered Pumpkin to your decor. Use it as a table centerpiece, or as part of a porch arrangement. Dare to be different! 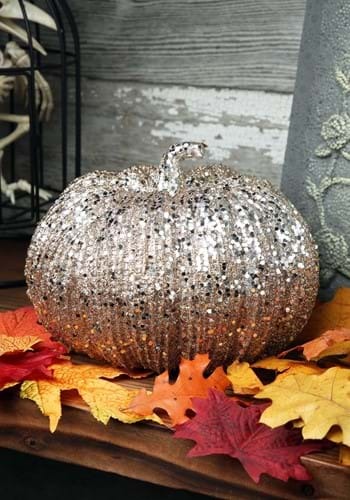 Why would you want a plain, garden-variety orange pumpkin when you could have this 13 Inch Silver Glittered Pumpkin? Dare to be different and use a unique color scheme for your Halloween decor. You can put this on a porch, a stairway landing, or just in a corner by itself. The frost is on the pumpkin, and so are the spiderwebs! 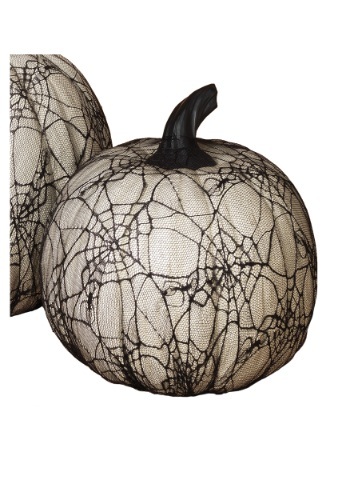 This large 16 inch Spider Web Pumpkin will be a great focal point for your porch display. Combine it with other pumpkins, or with spiders and spiderwebs, or both! Use these 36 Piece Black Glitter Mini Pumpkins to accent any decor. Let them anchor place cards on a party table, or just scatter them among the dishes on a buffet service. They'll add a touch of class! Get in on the newest trend in Halloween decor--purple! Even though there's no such thing as a purple pumpkin in nature, there can be in your decor scheme. 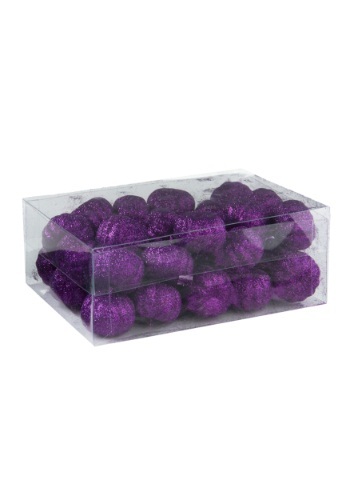 Just get these 36 Piece Purple Glitter Mini Pumpkins. Scatter them wherever you want and accent piece. Spread the festive harvest decor around when you get our 36 Piece Small Pumpkin set! Perfect for the home! If you live in an area where it can be cold on Halloween, this 6 Inch Nickel Pumpkin adds realism to your indoor decor. It looks like a frost-covered outdoor jack-o'-lantern. You could even keep it out after Halloween, and make it part of a winter or Christmas display. You could spend hours painting a real pumpkin in a shiny coat of silver paint, then painstakingly adhering glitter to it as well. 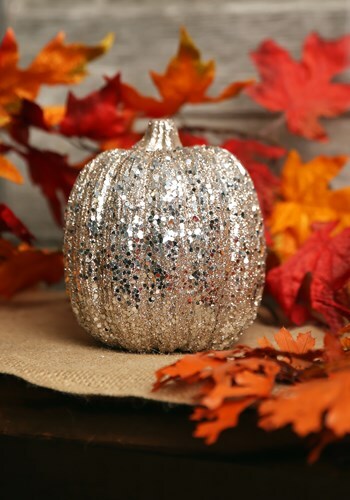 The end result would look a lot like this silver glittered pumpkin, but you'd have a big mess to clean up. Or, just get this fancy decoration! It arrives ready to display and impress any visitors you may have, especially those with a sense of style. It might be hard for your children to understand why they can't carve this 6 Inch Weighted Pumpkin, but you can explain that it can be used year after year. Add this great decor item to your scene! Bet you've never seen a pumpkin that totally glistens and shines? This 6" Purple Glittered Pumpkin is the party pumpkin. Make sure you place this glittery decoration in a spot where everyone will see it. Halloween decor doesn't get any more basic than a plain orange pumpkin. And this 6"x 9" Pumpkin is a great place to start. There's no messy carving to deal with, and it won't ever get smelly like a real one. If the mood of your Halloween decor is dark and moody, this 6.5 Inch Black Glittered Pumpkin is a perfect addition to your scheme! Of if you just generally like a Gothic feel, it's good for that, too. You can't have Halloween without a few pumpkins around. We tried it and it just feels wrong. This pumpkin decoration makes sure that you have one on stand by every year, no matter what kind of pumpkin situation your local produce market is having. Even if there's a pumpkin shortage, you'll still be covered. It's kind of like having Halloween insurance. Sometimes it is refreshing to see a pumpkin that isn't orange! You will be amazed and enchanted by this beautiful 6.5" Round Mercury Pumpkin. It looks great on a dining room table! Ever wonder what kind of pumpkin wicked royalty keep in their house? The truly wicked ones prefer to have glittery pumpkin decorate their home. Do the same and pick up this 6.5" Round Orange Glitter Pumpkin. Forget a disco ball! Just hang up this 7 Inch Champagne Glitter Pumpkin and let the boogying begin! The problem with this pumpkin is that it's one of those disco-hating pumpkins and would much rather be listening to something like Calypso or Bossa Nova. That's right, this glitter pumpkin, despite the fab, is more of a chill, lounging type... so kick back with a nice Mai Tai and enjoy Halloween in style with this hep pumpkin! If this pumpkin were a celebrity, it would definitely be Ke$ha because it's covered in glitter! Unfortunately, it's not a celebrity though, it's just a pumpkin... well, maybe it's an up and coming pumpkin. It might take a few roles as an extra, finally getting a speaking role, and then appear in some indie darlings. After that, it might just star in its first Hollywood picture, "All that Glitters is Pumpkin" and FINALLY reach the peak of stardom it has dreamed of since it was but a seed. Then you get the satisfaction of name dropping to everyone you meet, saying that you knew this pumpkin before it was big. This pumpkin is almost as flat as a pancake! Make your house a little more festive for the holiday with this 7" Round Resin Jack O Lantern. The LED light flashes pretty colors when the switch is turned on! White pumpkins started out as a freak of nature, a rare genetic mutation that turned off the orange color and made an albino. But they became popular, so growers began breeding them specifically and developed several naturally white varieties. Use this 7"x 6" Cream Pumpkin to accent a group of traditional orange ones, or on its own as a table centerpiece. If you're going for a simple, classic Halloween decor scheme, you simply have to have at least a couple of plain orange pumpkins. This 7"x 6" Pumpkin is a perfect example. And once Halloween is over, you can keep it out for a harvest or Thanksgiving theme. And since it's made of foam, it won't get messy and smelly like a real pumpkin would! There's been a glitter explosion in the pumpkin patch! All the pumpkins are covered in super sparkly glitter. If you try carving this pumpkin, glitter will pop out (we're kidding about that, but there is a tons of sparkles on this pumpkin!). Looking for a unique way to spice up your seasonal decor? 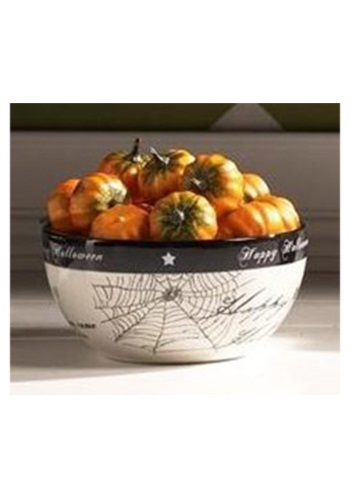 This white resin pumpkin with spider web lace looks spooky and elegant at the same time. The pumpkin is highly detailed for a realistic appearance, so you can enjoy an authentic decoration that doesn't require a trip to the local pumpkin patch. Now you can have the prettiest pumpkin in all of the land! 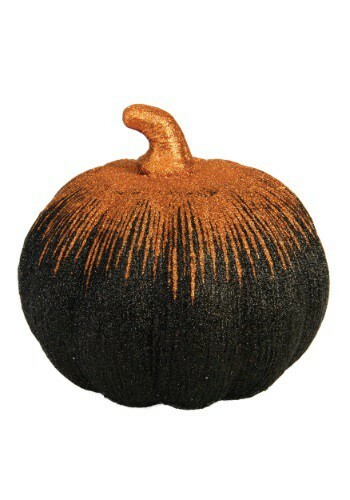 This 8 Inch Nickel Pumpkin has a beautiful metallic shiny finish that will look perfect in any room! Is that a little pumpkin I spy on your mantle? You won't have to worry about this pumpkin spoiling if you forget to put it away with your other seasonal decorations. It can sit out for months and months until it's almost Halloween again. And when you get to that point you might as well keep it up with the date so close! Home decor is very important when you are looking to create a 'spooktacular' holiday. Add this 8" Orange And Black Crackle Pumpkin into the mix. This pumpkin looks perfect anywhere you decide to place it. Halloween festive fun is as easy as 1-2-pumpkin! The harlequin or jester was a stock character in medieval dramas, always distinguished by the diamond-patterned fabric of his costume. 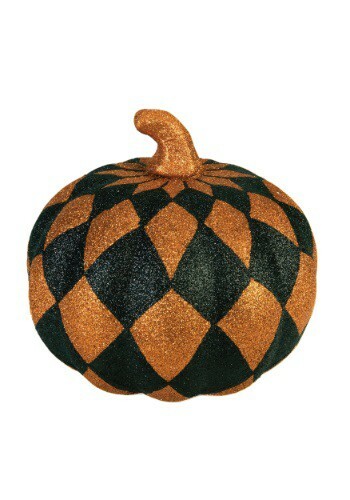 This 8" Orange And Black Harlequin Pumpkin lets you add a fanciful medieval touch to your Halloween decor. It's covered with orange and black glitter in that distinctive diamond pattern. Pumpkins make really great pies, but they don't always make the best decorations. They last 8-12 weeks, but then they can get a little funky. This 8" Orange And Black Starburst Pumpkin lasts a lifetime, so you can bring it out year after year. You never have to worry about it decaying! The only downside to this decoration is that you can't make a tasty pie out of it. This pumpkin has been enchanted by a spellbound warlock! Now all this pumpkin does in glimmer, shine, and sparkle. It's perfect for setting in a dining room or kitchen. Nobody grew this pumpkin... if they did it's pretty magical! It will look amazing on your mantel or table this Halloween and Thanksgiving. Sometimes a simple color scheme works best for decor, and it doesn't get any simpler than black and white. This 9 Inch Resin Black & White Diamond Pumpkin would make a perfect start to a black and white decor scheme. Pair it with other elements for a stark, dramatic effect. Don't settle for a non-creepy regular pumpkin. Those ones just look too delicious and orange, just waiting to be made into a delicious pie! This one decorative piece looks more like the spooky ghost of one of those fallen pumpkins used to make a fall dessert. And the best part about this pumpkin, is since it's a ghost, it can haunt your home for years, because it never goes bad. If you want a pumpkin that's perfectly symmetrical, this 9" Distorted Pumpkin doesn't fill the bill. But if you want a bit of imperfection, this is, well, perfectly imperfect! Add it to any Halloween decor scheme. 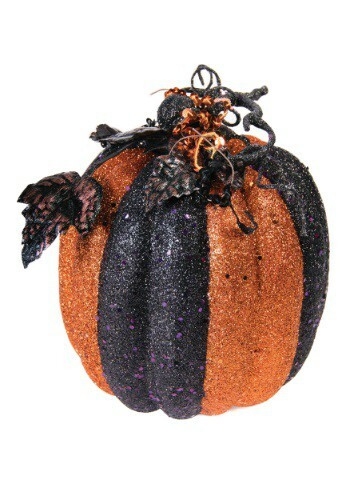 This sparkly 9" Orange & Black Striped Glitter Pumpkin isn't an ordinary gourd! It's dressed up in black and orange glitter, with a stem and leaves on top. Add glamour to a table arrangement or any shelf. Perhaps mix it with real pumpkins for a bit of contrast. Or just let it shine by itself on a porch. There's just something about squash that screams, "Halloween," to us. It might be the color. It might be the fact that you can turn certain ones into a delicious pie. It might just be that they're in season during the fall. It sort of stinks to have to toss them out every year after the trick-or-treating is done. Use them once during the year and it's over for them! That's not the case with this 9" Orange And Black Crackle Pumpkin! You can store it in your closet during the off-season, or just bring it out whenever you need to infuse your home with a little bit of creepy decor. A pumpkin that sparkles and shines? That's definitely not something you see everyday! It doesn't matter where you put this purple and black striped glitter pumpkin because it will get tons of attention and complements no matter what! 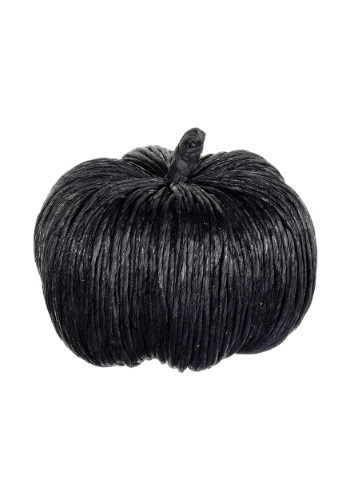 This Black Wire Glitter Pumpkin gives a stark look to your seasonal decor. It looks just like the tangled branches of a barren thicket in a haunted forest. So if black and bleak is your theme, this is perfect!